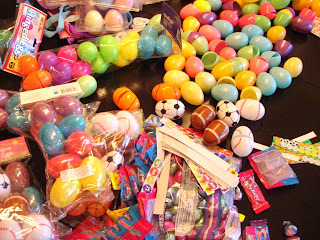 The Easter Bunny was busy last night filling eggs. We have our five nieces and nephews coming over on Sunday. It should be a fun weekend. Happy Easter! Hope you are around your peeps and have chocolate bunnies! Have a great Easter! Lucky nieces and nephews! Have fun! The candle is on it's way. You'll know it's in your mailbox when you open it. It will smell yummy. Happy Easter! I hope you have a lovely one.